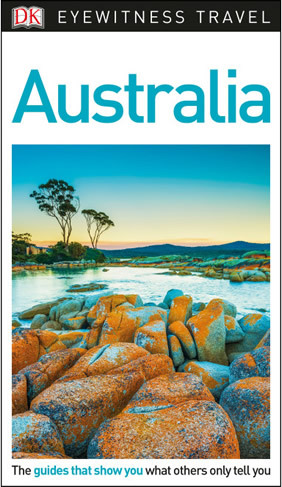 Melbourne, Yarra Valley, Ayers Rock, Sydney, and more! 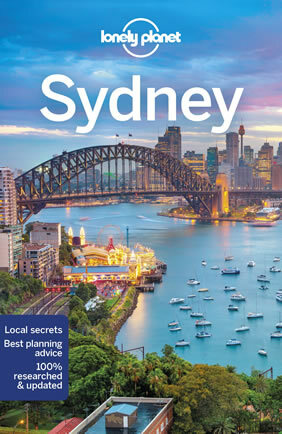 Explore Gay “Down Under”, including visiting the Sydney Opera House to dining with an Aboriginal family. 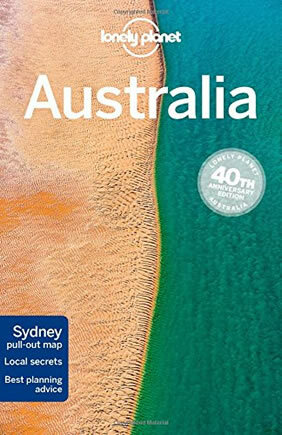 From sophisticated afternoon tea and 4-wheeling in the Outback, to sunset dinner aboard a private yacht and a fabulous Gay Mardi Gras, this is the trip of a lifetime! Beginning in Melbourne and ending in Sydney, this trip is one of our most amazing and culturally diverse Gay adventures ever! 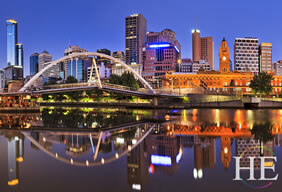 We will spend three glorious nights in luxurious accommodations in Melbourne, on the banks of the historic Yarra River. 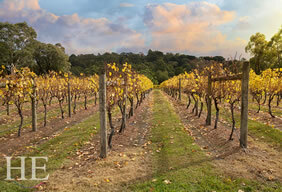 From Melbourne we will drive up into the hills to explore the Yarra wine region, and taste the delights it has to offer. 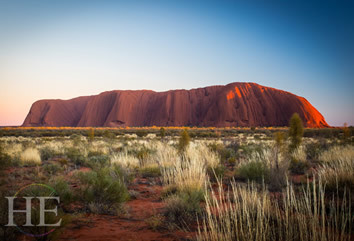 Our next three nights are in the Outback, marveling at the iconic Ayers Rock and Cave Hill. During our sojourn there, we will learn about the Aboriginal way of life through an amazing art and light installation in the desert after dark. We take a 4-wheel-drive tour to one of the most historically significant sites in central Australia, and view magnificent cave paintings. • Meet the remarkable Aboriginal people and dine with them in the bush! • Learn about “Dreamtime” and see the petroglyphs! 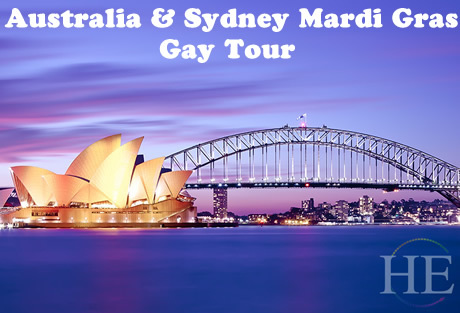 • Join in on the big GAY fun at Sydney’s magical Mardi Gras! Day 1 - Arrival in Melbourne, Australia. Welcome to OZ! Most flights from North America arrive by mid-morning, whether non-stop or via Sydney, so an afternoon Melbourne city tour and tea will welcome us to this friendly city. The evening will be at leisure to stroll along the riverbank and dine at one of the many al fresco cafes and restaurants of every possible ethnicity. Then take time to rest and recover from the long journey and adjust to the time change, since you’ve just jumped ahead an entire day! After a delightful breakfast, we will venture out to the world famous Yarra Valley, renowned for its pinot and chardonnay wines. Morning tea can include something bubbly, as well as a cheese tasting (and some tea!). During our tour we will sip, swirl and sashay our way through some of the valley’s finest wineries as we are regaled with stories from Australia’s most prominent wine makers. After a morning on your own in Melbourne, considered “one of the most liveable cities in the World” you will be picked up and whisked off to the Colonial Tramcar! This is one of Melbourne’s star attractions, offering a sightseeing tour with a difference and two essential Melbourne experiences; a tram ride and great food! You’ll be welcomed aboard your 1948 Melbourne tram restaurant by a smiling maître d’ and be served your four-course lunch by a friendly, professional team of silver-service waiters. Delicious meals featuring fresh local produce are prepared on-board the tram and a wide choice of alcoholic beverages is available from the fully stocked bar. Day 4 - Outback here we come! As darkness falls, our “Night in the Field of Light” begins, one of the most memorable experiences of our trip. This art installation of 50,000 glass spheres of coloured lights gently sparkle to life as we indulge in an outback-inspired gourmet buffet. 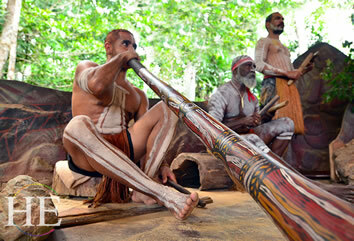 A local Indigenous performance will add to the wonder of the evening. Day 5 - All about Uluru! We will get up before dawn today for our guided walking tour to a special location from which to observe an amazing sunrise over Uluru. After an Outback picnic breakfast, we will learn about the Mala people, and hear their stories of world creation with “Liru” and “Kuniya,” two snakes often depicted in their petroglyphs. We will visit the Mutitjulu watering hole, an amazing natural phenomenon, before returning to our resort and enjoying an afternoon at leisure. After breakfast, off for adventure! Our 4-wheel-drive safari to Cave Hill takes us deep in to the Outback for a cultural experience that will provide us with an insight into everyday Aboriginal life. • Tan, bodysurf, and swim. Head to Tamarama Beach, a particularly gay spot during this pre-Mardi Gras week, or its more famous neighbor, Bondi Beach. These are perfect spots for the great Australian sport of lifeguard-watching. Day 8 - Animals, Art, Opera House and MORE! After breakfast, it’s time to get up close and personal with some animals! 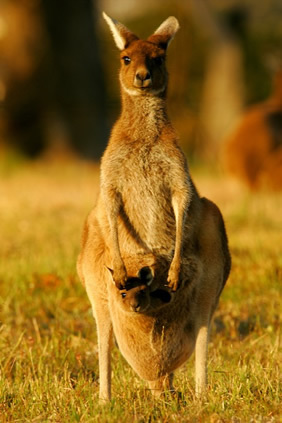 We will start with a safari in the sky on an included cable car, and then come down to Earth with a 1 hour tour of the Taronga Zoo, one of the most highly regarded facilities of this kind in the world. And we’re not through yet, for now it’s off four an overview bus tour of Sydney, including stops at the Art Gallery of New South Wales and the Museum of Contemporary Art. For our late lunch, relax and unwind at one of Sydney’s newest dining spots, Opera Kitchen. The restaurant brings together some of Sydney’s best chefs, food artisans and producers who each feature dishes made famous in their own restaurants. Soak in the Sydney Harbour views while enjoying a tasting plate of culinary delights. Day 9 - Dreamtime, and Gay Australia Mardi Gras! We start our day with a short trip to The Rocks, just under the Sydney Harbour Bridge. One of Sydney’s first English settlements was here, but this strategic location jutting into the harbor has long been held sacred by the Aboriginal people of the area a well. An Aboriginal guide will lead us on a 90-minute walkabout tour around The Rocks to learn about Sydney’s “Dreamtime” Heritage. The traditions of these saltwater Aboriginal people share some attributes, but are also quite distinct from the culture of their distant cousins whom we met earlier in the Red Centre near Uluru. The rest of the day will be soaking up the festival atmosphere. There’s no way to describe the Sydney Gay & Lesbian Mardi Gras except with superlatives. It’s the world’s largest Mardi Gras celebration, Australia’s biggest attraction for overseas visitors (and for locals, both gay and straight), and the world’s grandest gay party. In fact Sydney Mardi Gras is a month-long event, with gay and lesbian cultural, social, and sporting events, culminating in the festive parade and countless parties. The parade is followed by an official all-night Mardi Gras party, and dozens of unofficial parties around the city. Party tickets are not included with our package, but we’ll advise on how to get them. It’s not difficult, but you do need to order well in advance most years. Harnesses, helmets and gloves are provided. The Climb starts when you attach a strong carabiner (hook) onto a continuous metal rod that goes all the way up to the top of the bridge, and all the way down the opposite side. You walk part way onto the bridge, climb up a ladder, then start the gradual ascent to the top. The footpath is wide enough that most people don’t get too scared – but it’s not recommended to spend much time looking down at the speeding cars and subway trains a few stories below! At the top you walk from one side of this great icon to the other, and Climb Leaders will point out key landmarks. A clear day will afford you views that stretch from the Pacific Ocean to the Blue Mountains. You then return to the starting point on the opposite side of the bridge. Tonight we head out on Sydney Harbour’s sensational sunset dinner cruise for our Farewell Dinner! We will board our luxury yacht and be mesmerised as the sunset reflects ever-changing light on the Sydney Harbour Bridge and the Sydney Opera House. Our cruise concludes with a shipboard gourmet barbeque dinner with 5 star service, so enjoy your evening! What a special way to wrap up an amazing adventure and celebrate with our new best friends! Day 11 - Goodbye Mates! After breakfast, transfers will be provided to the airport, then it’s off to home. Or for more high adrenaline fun and frolic join our “Wild Kiwi” New Zealand Adventure! for details! 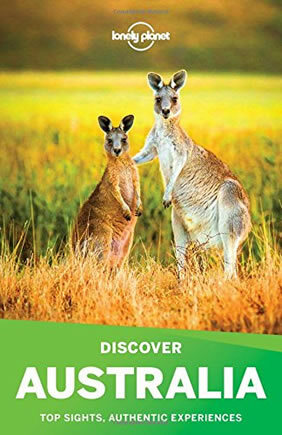 • Services of an HE Travel tour director accompanying the group within Australia (subject to minimum participation). • Gratuities for tour director and local guides. This Cultural Tour of Australia requires some walking on each day, at a modest pace, often on uneven surfaces. Someone with less mobility could still enjoy the tour, but would need to sit out some of the more strenuous activities. Each of the hotels used for our tour is one of the highest rated hotels in its area. We have chosen our deluxe hotels due to their history and comfort – and uniqueness! Our two city hotels are in central locations allowing easy access to charming restaurants, cityscapes and nightlife.